This is about the hours I spent away from him — and the book I found as a result. Driving along West Congress Street in Lafayette — not too far from the University of Louisiana-Lafayette campus, and the site of that night’s ballgame — I saw the sign for Alexander Books. It appeared to be the classic used bookstore built into a former real estate/accountant office which had been built into a former home. In other words: my kind of honey pot. Before this year’s resolution, I would seek these kind of places out. I can tell you where to find the most charming used and rare books stores in almost every city in the majors or around the National Hockey League. I saw these bookstores as a series of unending scavenger hunts — finding them was the first step to the true goal of unearthing a prized book. I would seek to find a book that captured the city I was in (like, say, a Mordecai Richler book from Odyssey Bookstore in Montreal), a book I hadn’t been able to find elsewhere (I spent a year or so looking for a used copy of David Halberstam’s The Powers That Be before finding it in the girlfriend/future wife’s hometown of Washington, Mo. ), or a book like the one I found at Alexander Books — the white whale, an unexpected gem. This was not a book to be judged by its cover. Tiny in height compared to the wilderness of tomes around it and bound in a bland brown cover, this literary featherweight would not have caught my eye at all had it not been for the last word in its title: Kendall of the Picayune. Almost a year earlier I had been hired by The Times-Picayune in New Orleans — my first job out of college — and I knew enough about the paper to know Kendall was probably G. W. Kendall, one of The Picayune‘s founders. I had (I still have!) a reproduced copy of the four-page debut of the paper, and there’s Kendall’s name next to F. A. Lumsden’s under the masthead proclaiming Vol. 1, No. 1 of The Picayune. Fayette Copeland’s book clearly was not content to chronicle Kendall’s founding of New Orleans’ lone remaining paper alone. Indeed, by the third chapter Copeland’s book the Picayune has been printed and is, according to the chapter’s title, on the way to “its first hundred years.” By chapter five, Kendall is off to Texas. Still, for $22.50 I had a first edition book that told the tale of the paper’s — my first paper’s — founder, and I had a few hours to read about it before meeting Guidry in the bullpen. Editors are often tempted by the Devil to do strange things, and our diabolus ad typo, puffed up with technicality and temerity, suggested the title of the small picayune as a demon-stration. But the Devil was cast out; and what is most extraordinary the office was too hot to hold him. … The PICAYUNE will be built of the best materials but instead of being copper-fastened she will be leaded. The article goes on to address groups of readers specifically; like pirates and “hotel-keepers,” the theaters and the politicians (“We predict a calm,” the paper says). The larger papers were complimentary but thought little of the Picayune. That changed as Kendall amplified New York trends and pushed the Picayune toward “scoops.” Copeland describes how Kendall would go upriver from New Orleans, interview workers and traders coming in from other places, like Texas, and have the paper printed and their stories told by the time the boat docked in New Orleans. Other papers didn’t have their interviews before the Picayune had the story in its readers’ hands. As Kendall and his associates looked over the first issue, they debated the number to publish, Copeland supposes. Would 300 be too many? Would 500 be just right? Kendall had the final say. He printed 1,000 and had them ready for distribution the next morning — January 25, 1837. That is, 175 years ago today. 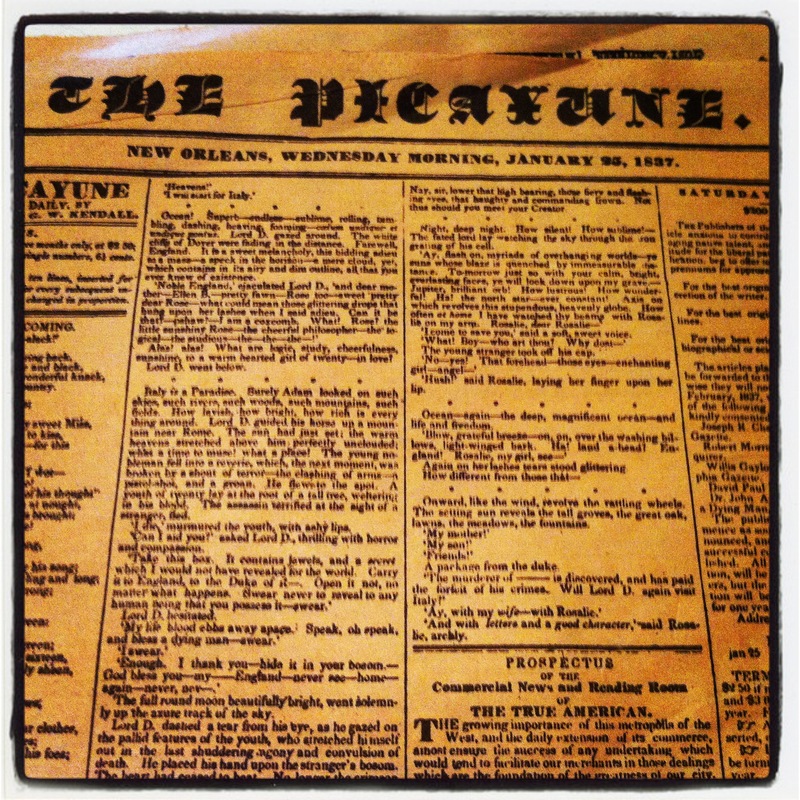 A reprint of the first edition of The Picayune, which hit the streets of New Orleans 175 years ago today. The founders of The Picayune, George Kendall and Francis Lumsden, knew full well that the future of the newspaper hinged on the loyalty of its readers. They were worried they might not win it. Copeland’s book, published in 1943, spends most of its pages telling how Kendall went from publisher and printer to celebrated writer, who was imprisoned in Mexico City and later brought news back of war in Mexico and life in Texas, where he eventually retired to and died. As his illnesses increased, Kendall was bought out of the Picayune. He died nearly 50 years before his Daily Picayune became The Times-Picayune. A decade after his death, The New Orleans Item first published, and it later combined with another paper to become The States-Item before being swallowed whole and leaving New Orleans as a one paper town. By the time I had to get to the ballpark, I had read only deep into Copeland’s book to get the Picayune published and ahead of the postal service when it came to reporting news. I’ve revisited the book for nibbles here and there ever since, and during a recent trip to New Orleans a friend and I found another copy on a shelf at Faulkner House Books. The lore of the paper’s history — heck, William Faulkner wrote stories for The Times-Picayune — and the energy of the paper’s present fueled the pride I gained and have always kept in starting my career there. During the early days of the paper, as Kendall worked the river boats for his scoops, the paper was described as a “saucy little sheet” with a fierce independence and strong local pride. Yep, even at 175, it still is. Mind the gap! There is a break, of course, in the journal entries here. An indictment on my ability, less than a month in, to keep up with this zany one-a-day entry schedule? Not so. We just returned from the annual January family vacation abroad and unsure of the Internet access/free time I’d have I kept the journal going the old-fashioned way — on paper, by hand. Over the next couple days I’ll back-fill the entries by moving the written word into the virtual world, thus mapping a course that took me from Washington, D.C. and the White House one day to Willemsted, Curacao the next. I appreciate the patience. This entry was posted in journal, journalism, newspapers, project 365+ and tagged journalism, new orleans, new orleans times picayune, newspapers, ron guidry, the times-picayune by dgoold. Bookmark the permalink.